Much of the spirit of ancient Siam lives in the north where today, hill tribes still pursue their traditional lifestyles. 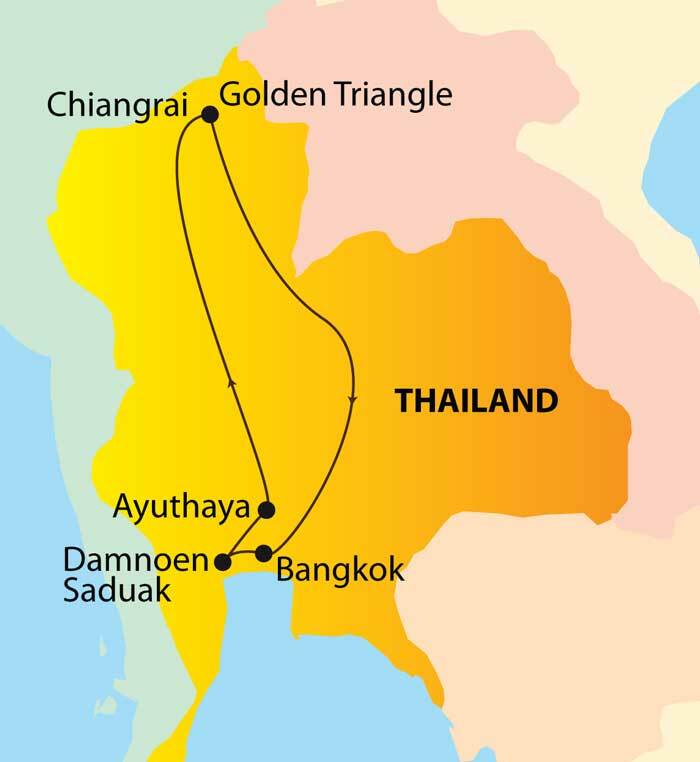 After sampling the rich history of Bangkok, this tour takes you to Chiangmai, the artistic centre of Thailand before exploring the beautiful Golden Triangle where it borders on Laos and Burma around Chiangrai. Exceptional mountain vistas, thrilling elephant rides and insights into the lives of tribal people, make this a magical experience. Enjoy a full day excursion to Ayuthaya, capital of Siam from the 14th to 18th centuries. Afterwards travel by riverboat back to Bangkok enjoying lunch on board. Today we tour the heart of tribal and meet the Yao and Akha hilltribe people to see how they live. Stop for lunch at Mae Sai on the Thai/Burma border, before driving through the famous Golden Triangle where Thailand, Burma and Laos meet along the Mekong River. We will also see the magnificent ruins and temples near Chiang Saen before returning to Chiangrai. Today we return by air Bangkok for a final night in Thailand. The balance of the day and evening is at leisure. Tonight there is an optional dinner at the famous Seafood Market and Restaurant where we choose our own ingredients for an amazing seafood dinner. Overnight Golden Tulip Mandison Suites.